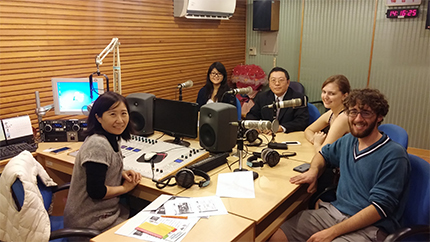 Brendan Ryan, a National Security Language Initiative for Youth (NSLI-Y) participant studying Chinese in Taiwan, has been named American Abroad Student of the Month for March 2015. Brendan, who hails from the small Mississippi town of Diamondhead, has quickly become an active and enthusiastic member of his new community in Kaohsiung, one of the largest cities in Taiwan. As a volunteer at an elderly care center, an interviewee on a popular radio program, and a guest speaker at a host family recruitment event his enthusiasm for cultural exchange has been palpable. Brendan continually seeks out opportunities to share his overseas experience, including creating an attractive blog and contributing to the NSLI-Y Taiwan website. He also presented at the first NSLI-Y Interactive virtual event, which connected NSLI-Y participants with students studying Chinese at U.S. high schools.